I have a 17″ Macbook Pro configured with a bootcamp partition. I usually do my daily development work on this when I have to go on site at a client. I work with Visual Studio 2010 building web apps and desktop tools. 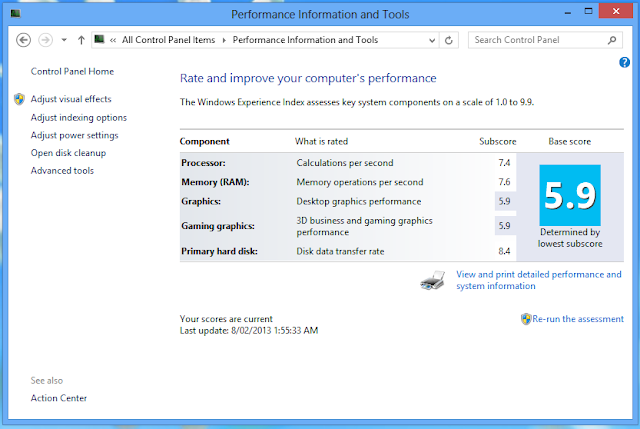 As soon as I bought the laptop I replaced the stock 750GB 5400rpm drive with a 480GB OWC SATA3 SSD. I also added a data doubler kit from MacSales and replaced the DVD drive with a 250GB Corsair SATA2 SSD. 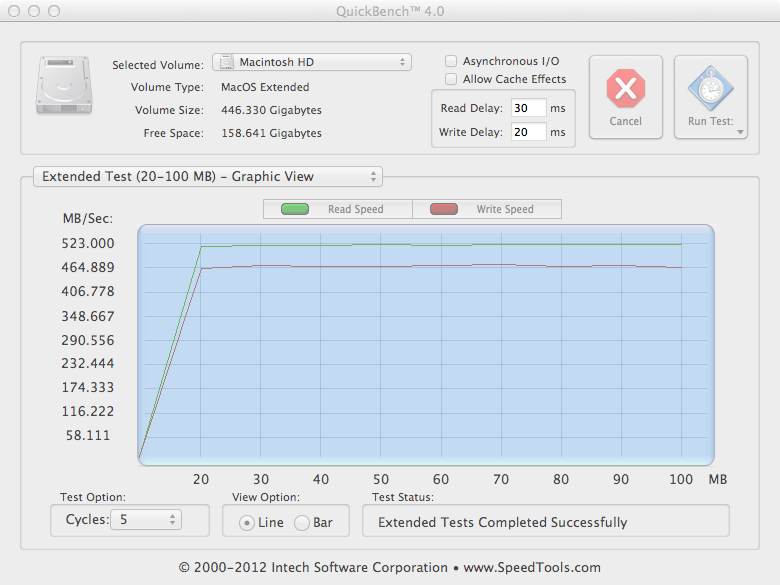 After some hair pulling and firmware upgrades to the Macbook Pro I was able to get some great benchmark speeds on the OWC SSD under Mac OS X, but under Windows the speeds were only averaging SATA 2 speeds. The performance was as expected – Max Read Avg. 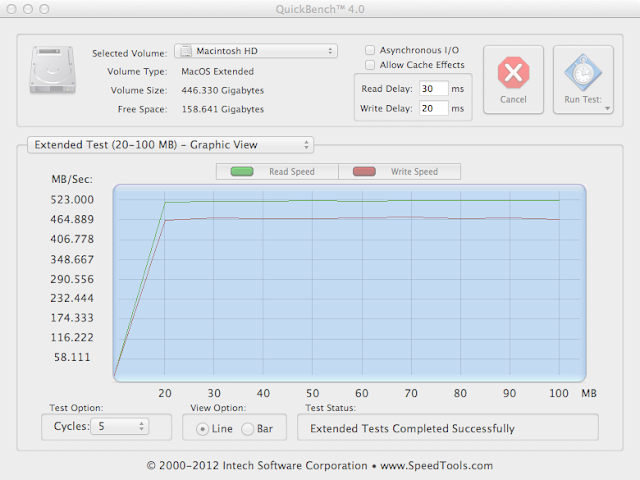 520MB/s and Max Write Avg. 469MB/s. 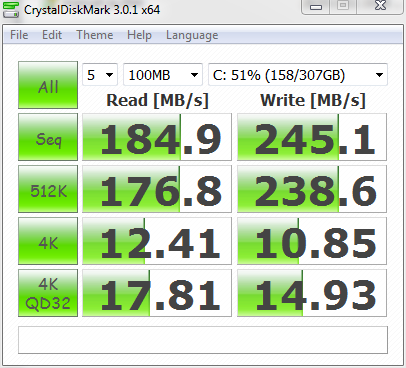 These results are what you’d expect from a SATA 3 SSD. As you can see, the throughput seems to be capped around the 240MB/s – 250MB/s – for both Reads and Writes. 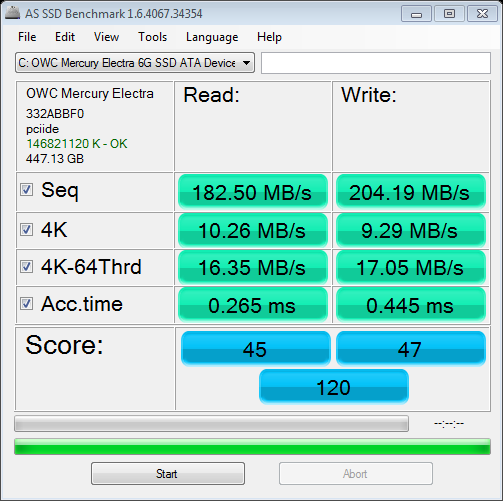 Quickbench and ATTO Disk Benchmark show this very consistently, however there is a bit more variance with Crystal Disk Mark and AS SSD Benchmark. I put these differences down to variations in the tools and possibly other disk activity. But you get the picture. Something isn’t right. After a lot of hunting around the various Apple and OWC/Macsales forums and blogs etc… I couldn’t find anyone who had noticed this difference in performance. 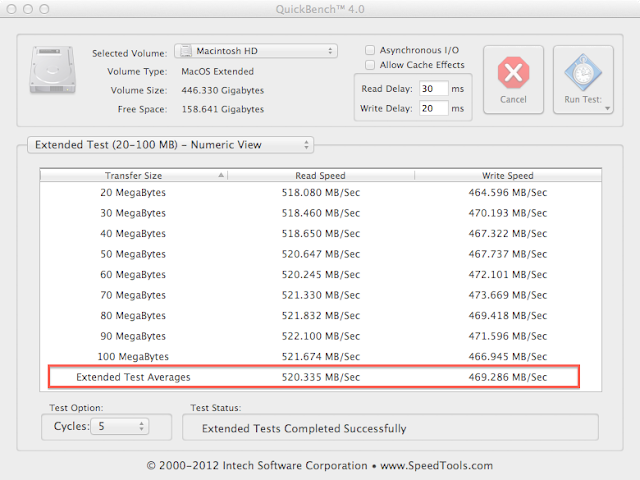 Eventually after opening an email dialog with the OWC staff, they determined that the bottleneck is the Apple Bootcamp drivers. I was running 64bit windows with bootcamp v3.3, so I’m not sure if it was a 64bit issue and switching to 32 bit Windows would have produced a different result. 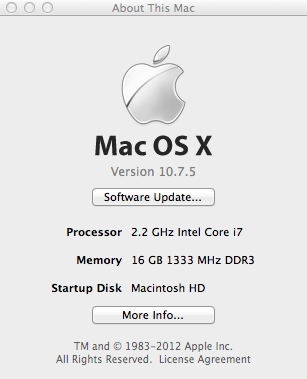 I had 16GB RAM so didn’t want to forego the memory benefits of running a 32bit OS. 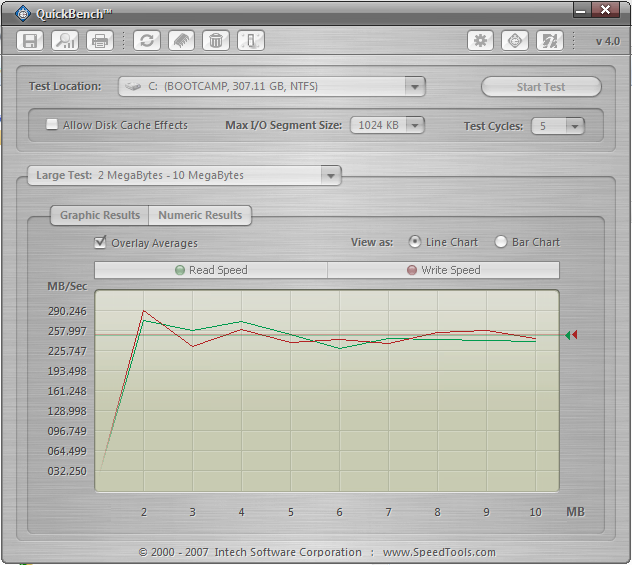 **Edit** I see now that Apple have release Bootcamp v5.0 which is 64bit only for Windows 7 & 8. These SATA driver issues might well be fixed now. I haven’t tested these combinations though. So what to do now? I’ve got an awesome laptop with a super fast hard drive and I want to get the most out of it… in both Mac OS X as well as Windows. The answer is Virtual Machines!! My hypothesis was that if the Mac OS X drivers were heaps faster than the bootcamp drivers, I could probably run Windows in a virtual machine, under either Parallels Desktop or VMware Fusion with a better result – despite a virtualised hard drive – than natively on the bootcamp partition. Would I be proven right!!?? Lets see! I used Parallels Desktop version 7.0 and VMware Fusion version 5.03. In all cases each virtual machine was given 4 processors and 8GB of RAM. This is effectively our baseline benchmark. 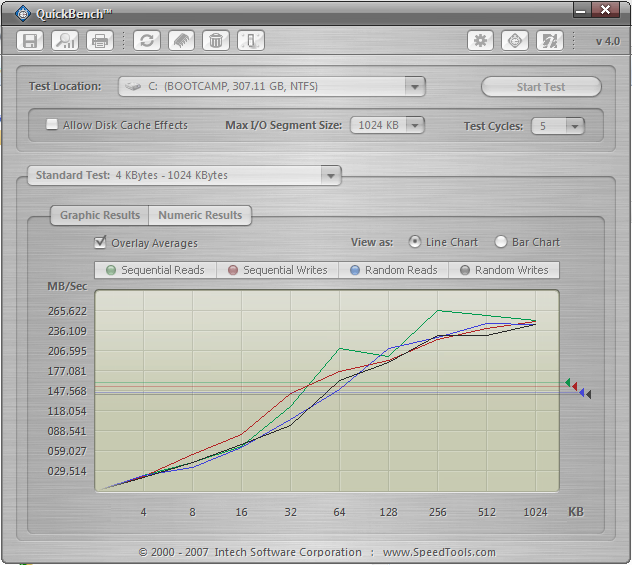 A 6.9 overall, with a 7.0 on the primary hard disk. 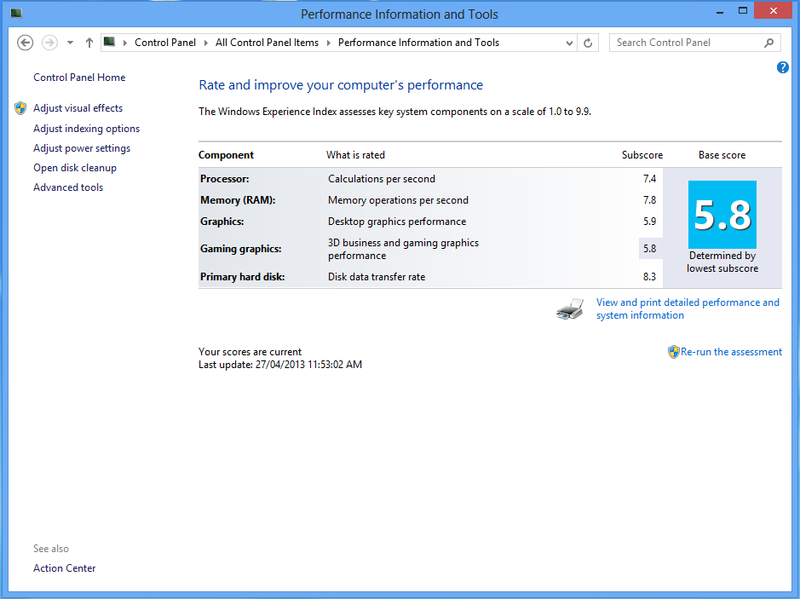 Note that memory and CPU are pretty good too. Next step is to see what scores I can get by running a VM, that is attached to the bootcamp partition – effectively running a native disk. 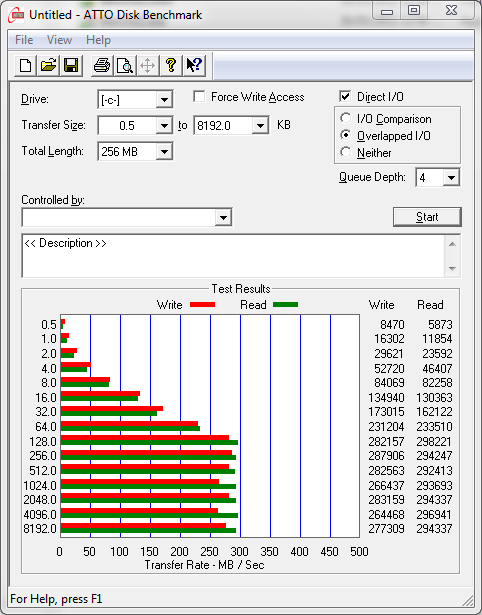 Fusion gives us a slightly better score overall, but the hard disk rating has dropped to 7.1. Bummer! 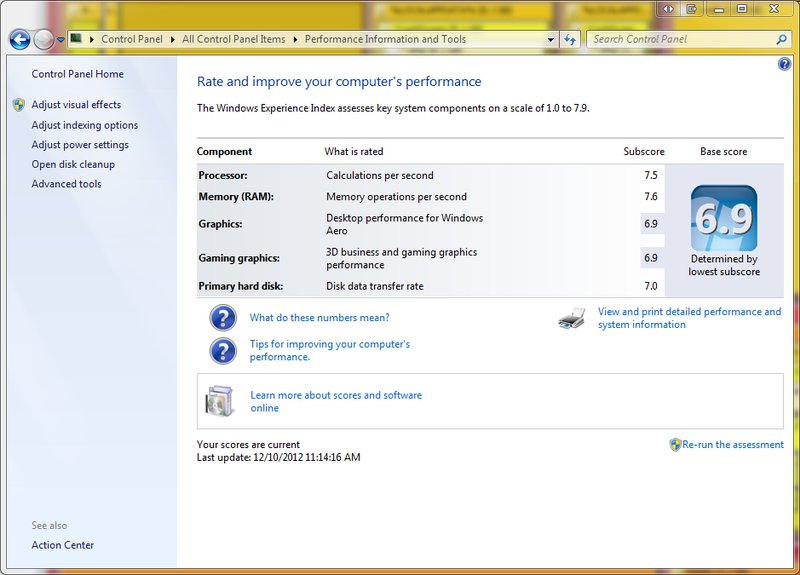 Look at those CPU and memory scores though. They are doing better than our baseline, booting natively into the bootcamp partition!! Next I created 2 new virtual machines, one each in Parallels and Fusion, but this time running Windows 8 (64bit). Wow! 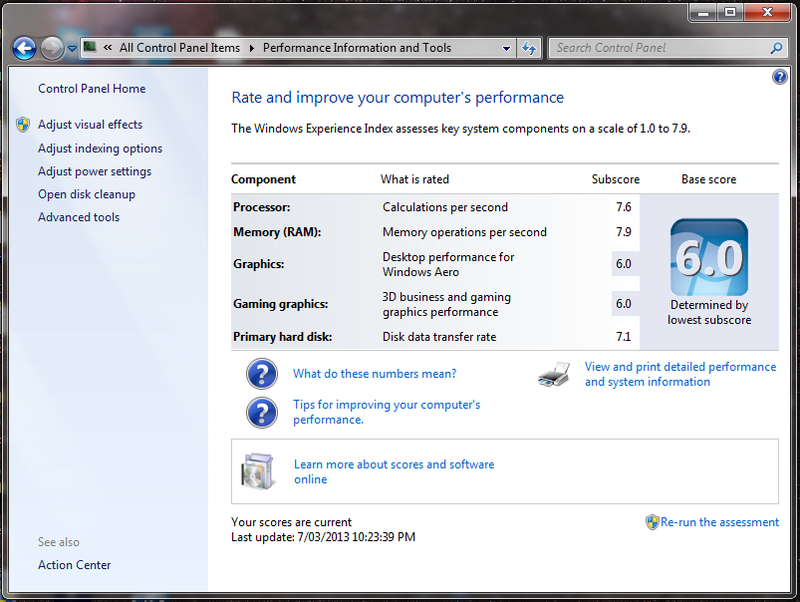 Look at that… an 8.4 disk score! 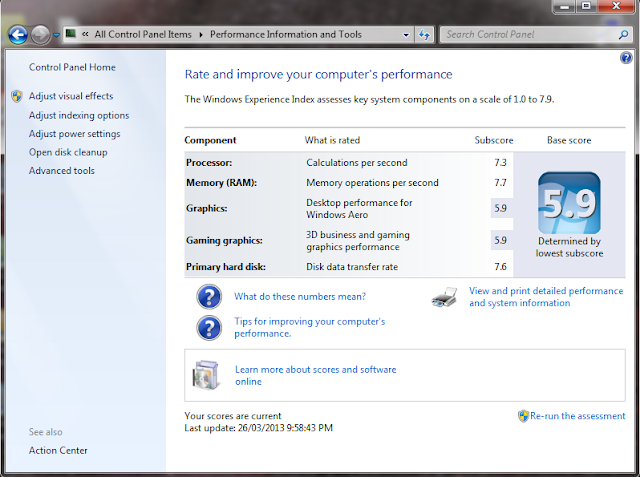 CPU and memory are still about the same, but the overall score of 5.9 has dropped as a result of the poor graphics performance. VMware Fusion was just pipped at the post on this one. 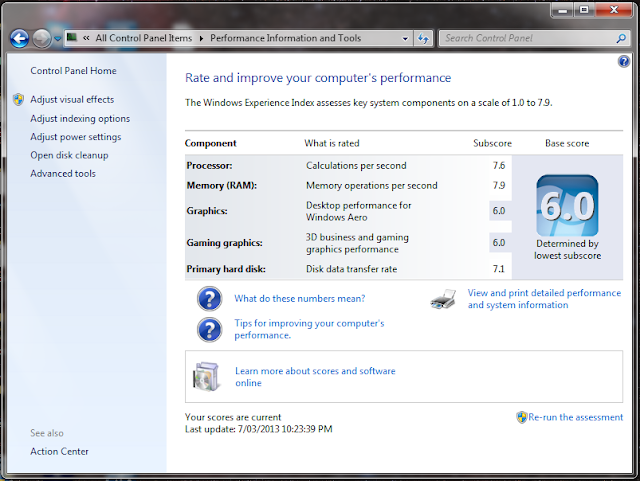 Disk score of 8.3 is nearly the same, but the graphics lets it down again. However we got a bump on the memory score! So what does all this mean?? What did I choose to go with? Well, despite the slightly slower score, I chose VMware Fusion. Why did I do this? I have been a long time user of VMware Workstation and I absolutely love it and couldn’t live without it for my day to day development activities. The two products are compatible with each other so if I need to migrate existing virtual machines I have across to Fusion, I can do that easily. I know that Parallels has some nice import features too, and I’ve used them successfully too. But in the end it was close enough that I don’t think it would really matter. I know this is a long post, but hopefully it’s been helpful for you if you’ve been wondering about whether it’s worthwhile running Windows VM’s under Max OS X instead of going the bootcamp route. In my opinion, it is absolutely not only a viable option, but a performant one too. I have now deleted my bootcamp partition, migrated it across to a Fusion VM for archive purposes, and I am in the process of building up Fusion VM with Windows 8 x64, Visual Studio 2012 and SQL Server 2012 to do all my .Net development. So far it’s working great. This entry was posted in Bootcamp, Developer Machine, Parallels Desktop, SSD Performance, VMware Fusion on May 1, 2013 by Stuart Clement.